pixel What To Do When Your Cell Phone Falls in Water ? | मोबाइल पानी में गिरने पर क्या करें ? What Should You Do When Your Cell Phone Falls in Water ? 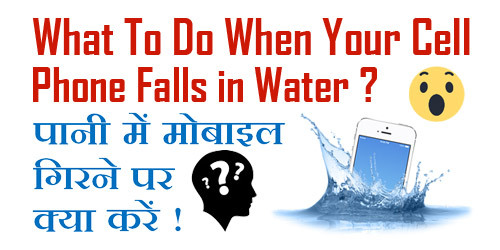 उम्मीद करते हैं आपको इस प्रश्न का उत्तर मिल गया होगा - What To Do When Your Cell Phone Falls in Water ? 1.) 7 Best Tricks To Make Your Mobile Unreachable ! | ऐसे बनाएँ मोबाइल Unreachable ! 2.) 7 Powerful Tips To Keep Your Mobile Virus Free ? | ऐसे रखें मोबाइल वायरस फ्री ! 3.) How To Make Your Android Smart Phone's Battery Last Longer in Hindi ? 4.) How To Improve Your Android Smartphone Speed With 5 Great Tips in Hindi ? 5.) अब मार्केट में खुलेआम बिक रहे हैं नकली मैमोरी कार्ड, आसानी से ऐसे करें उनकी पहचान !